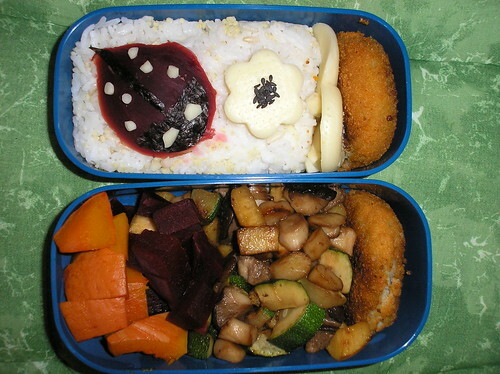 I had the idea for this bento some days ago when I cut the beetroot. A round piece with a nice pattern that looked almost like wood grain. But I didn't have a place to put the ladybug on and I was in a hurry anyways, so I postponed it to another day. The ladybug is made of beetroot, nori and cheese. It is sitting on top of rice and millet in front of a cheese flower with sesame seeds. There's more cheese and half of a fish patty in this tier, too. The other tier contains cooked squash and beetroot, sautéd king trumpet mushrooms, swede and zucchini and the other half of the fish patty.